Image courtesy Peter Savin (c) 1999. Ever since "Yesterday's Enterprise" first ran I've wanted a kit of the USS Enterprise-C. There have been several resin kits over the years, some better than others, but I held out for an injection molded model that wouldn't break my budget. After more than a few years, ERTL finally obliged with the latest release in their Star Trek line ... and thanks to Robert at Venture Hobbies I was able to get my hot little hands on a copy. So - first impressions are: this kit is not a stinker. It may well be the best Trek offering ERTL has ever done, in fact. The kit comes in the standard large ERTL box, with an artists rendition of the ship appearing to leap off the cardboard. Inside, the box is full of parts - 43 grey and 9 clear, including a three piece stand. All parts are bagged to prevent scratching. Scale is stated as 1/1400, and based on the dimensions of the kit this appears correct (as compared to info in the Star Trek Omnipedia). While not as massive as the Enterprise-D the large saucer makes this model seem large - so there shouldn't be the carping we heard when the Enterprise-E kit came out. As is, the kit depicts the early Ambassador-class ships, of which the Enterprise-C was probably the most famous. Several of the parts are extra - no doubt intended for the Yamaguchi kit to be released in several months (April '99). The extras include a second shuttle bay that sits under the fantail and several small plastic squares (probably lifeboat covers). Missing in this release are the different deflector, bussard scoops and ventral sensor dome of the revised Ambassador-class ships (Zhukov, Yamaguchi, Excalibur, etc.). ERTL reportedly will include these modified parts in their Pro-Shop Yamaguchi release - look for them on what is the only clear sprue tree in the Enterprise-C kit. Molding and Detail: Tamiya or Accurate Miniatures this ain't - but it's not bad. "Panels" are engraved throughout. They look a bit deep for the scale, but compare very favorably to what's actually on the studio model. They certainly are not the trenches we saw on the AMT Enterprise-A kit. Windows and raised areas are a little "soft". This is most noticeable on the lower portions of the secondary hull. One nice feature is the raised phaser strips - very crisply molded. Strips for the secondary hull are separate pieces - so cast a few copies to use with your kitbashes! I found one small area of flash in the entire kit and it was easily removed. Clear parts are very clear and sharp. The only really negative I can find is the (typically) huge sprue attachment nubs. Removing parts - especially the two saucer halves - will be tricky. Fit: Based on dry-fitting the main components I see only a few problem areas. The corrugated detail at the front of the engineering "neck" does not meet up across the two halves, and there appears to be a slight gap at the front and back of the neck. The nacelle pylons also appear to have gaps fore and aft. There is also a seam that will need to be filled around the circumference of the saucer, on the underside. It's not nearly as bad as the one on Revell-o-gram's Voyager, however. One nice feature is the molding of the neck to the secondary hull. Not only does it eliminate a tricky seam, it should all but eliminate the dreaded "saucer droop" disease other AMT/ERTL kits (most notably the Enterprise-A) suffer. 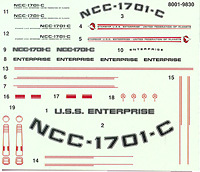 Decals and Painting: Decals are provided for only the Enterprise-C as she appeared in "Yesterday's Enterprise". Interestingly, the "rings" surrounding the large "Enterprise" name are black, instead of the usual red. This may well be accurate, as the original model was built and painted in a hurry and the detail overlooked. All the appropriate markings seem to be on the decal sheet. The paint guide is clear and well marked. A chart is provided listing all the paints needed, and includes FS matches. Less experienced modelers may have some problems with the colors, however. Several areas, in particular the shades of blue used for contrast, are marked as percentage mixes of two primary colors (80% A + 20% B). This is no doubt how the studio painters painted their model - but I could have used something a bit more descriptive. (Ah, well. I'll manage). On the plus side, the paint guide does appear to include all the markings and details of the original model, again as compared to the photos at the IDIC Page and Pedro's Shiporama. Rounding out the package are the usual ERTL exploded diagram, step-by-step instructions. The assembly sequence is logical and amply illustrated, and all parts appear to be represented. Looks like these are actually useable! Bottom Line: Looks like a good kit, boys and girls. Shouldn't be to hard to build - and there's enough room to light it or scratchbuild shuttle bays and other interior sections. It's certainly worth the $22-25 US the kit will set you back. Now --- wouldn't it be nice to have a Jem Haddar bugship next?